U.S. Transportation Secretary Ray LaHood announced Thursday that 46 transportation projects in 33 states and Puerto Rico will receive $511 million in the latest round of Transportation Investments Generating Economic Recovery (TIGER) grants. 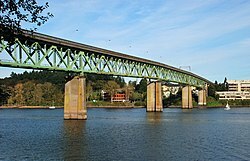 Multnomah County is among the recipients, for the Sellwood Bridge Replacement project. For more on the other awards, see CNN.com.